No matter what type of vehicle you are driving in, you always want to feel safe. And the Chrysler Pacifica is no exception. Although it is one of the youngest minivans in the market, it is one of the finest choices: thanks in no small part to its ton of interior features. And that includes the lineup of standard safety amenities it offers. On the Chrysler Pacifica, expect a generous collection of airbags for restraint and cushioning in the event of a crash. Dual front impact airbags prevent both front passengers from smashing into the steering wheel or dashboard, and their knees are protected with two additional airbags below them. Dual side-impact airbags are present to protect the front passengers’ thoraxes, and a pair of side curtains flank all three rows for head protection of all occupants. Plus, if there’s not enough light outside, daytime running lamps automatically turn on to make your minivan visible to pedestrians and other motorists, thus preventing unnecessary accidents. 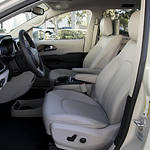 Ready to see more of what the Chrysler Pacifica has to offer? Then come on over to our dealership and test-drive it today.